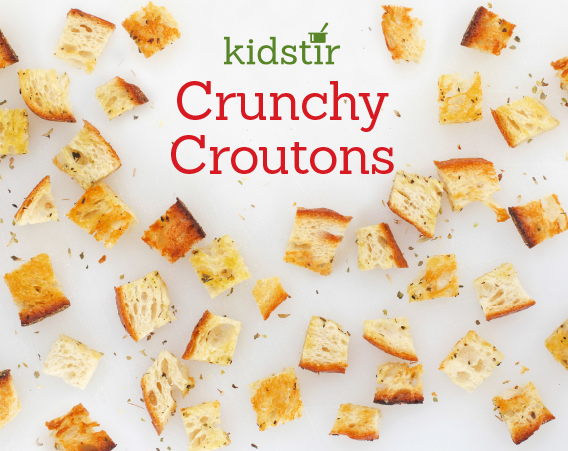 Top the Pizza Soup in your Kidstir Soup Kit with these crunchy croutons. Or, add a few to our Creamy Tomato Soup or toss them in your favorite salads. Homemade croutons are easy to make and taste better than their store-bought cousins. 2. A grown-up can help cube the bread on a cutting board with a knife. Arrange the bread cubes in a single layer on the baking sheet. 3. Measure the olive oil into a small bowl. Add the garlic, basil, oregano, and salt. Paint the seasoned oil onto the bread cubes. Toss the bread with (clean!) hands, then brush on the remaining oil. 4. Bake the croutons for about 6 to 10 minutes, or until light brown. Cool, toss on soup or salad, then crunch away!